Different types of encryption techniques are there that are implemented via SQL database automatically. Data protection is not an issue with SQL database but, sometimes SQL protection annoys users and that time they want to perform SQL decryption. 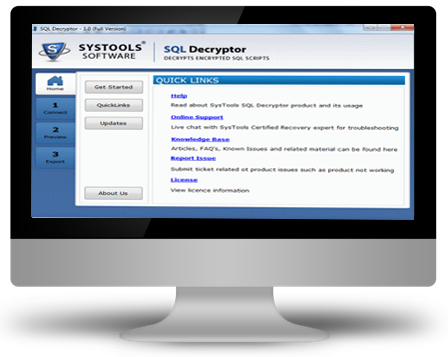 For secure and instant SQL decryption operation, SQL Decryptor software of our organization is the viable solution. To remove all the encryption from SQL files, our software has various abilities as it made the process to decrypt SQL file non-complicated as well as easy commands with our application made it choice of various SQL users. The one and only SQL decryptor tool can easily decipher each bit of the encrypted SQL database quickly and allows to access it. After decrypting SQL Server database objects the software gives the preview which users can verify and validate their decrypted data. Decode limitless highly encrypted SQL database objects and gives desirable results without any loss. After the successfully decryption of the database objects you can export the contents easily with the help of SQL Decryptor software. 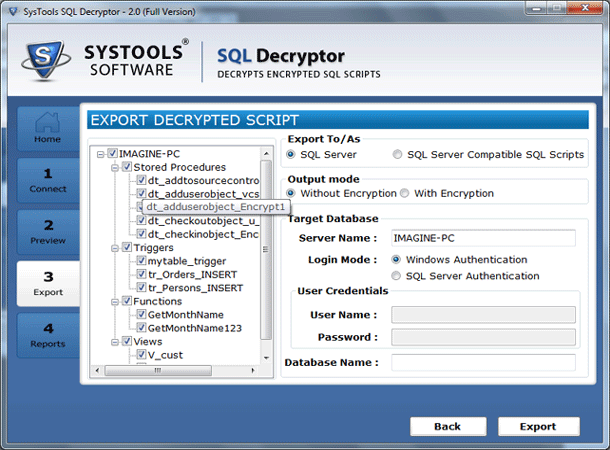 Software provides options to export the decrypt SQL script with encryption to the SQL Server/SQL compatible script. 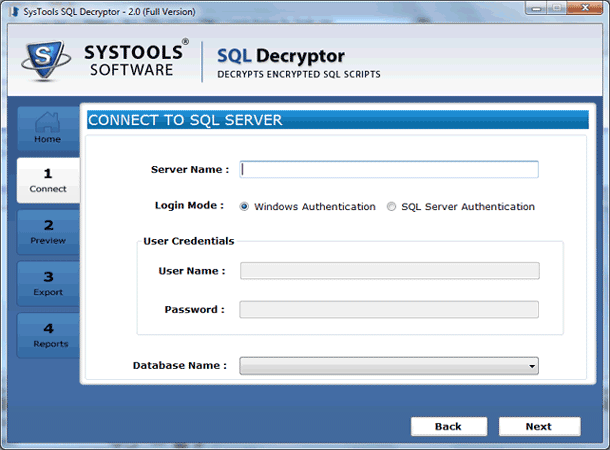 How SQL Data Gets Encrypted Via SQL Server Decryptor Tool? SQL Server offers its own encryption and decryption techniques but, sometimes during data decryption SQL files show annoyance. At such instance external application for SQL decryption is the only option you have. Transparent data encryption (TDE) uses a database encryption key (DEK) in SQL Server that handles database via boot record and with this encryption key user can check availability of SQL database during recovery. With TDE facility, software developers can make SQL database encrypted via AES and 3DES encryption algorithms without altering existing applications. TDE is optimized by SQL users as it keeps the data protected as well as it does not enlarge the file's size but, when the need comes to decrypt SQL file then, users might face issues as SQL decryption techniques are not easy to use with. 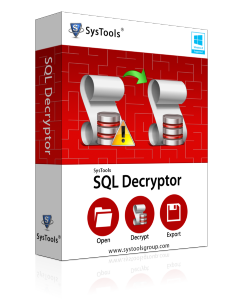 External SQL Decryptor is the only solution to decrypt SQL Script with no data loss or altering original protocols applied on SQL files. 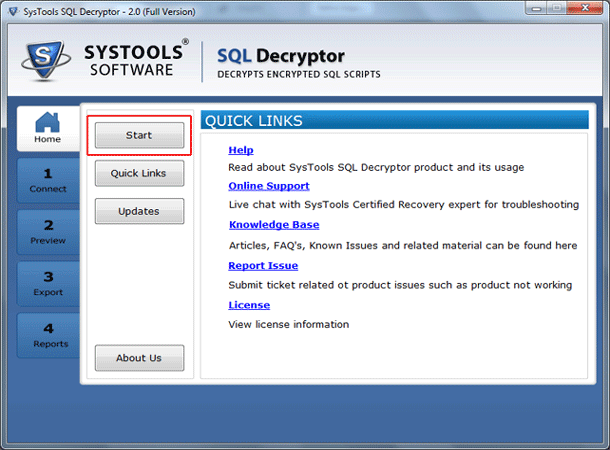 Why Use SQL Decryptor Software? Our SQL Decryptor tool does not destruct any property applied on SQL files after winding up SQL encryption removal procedure that is the reason behind why SQL encryption removal application of our organization became the choice of millions. 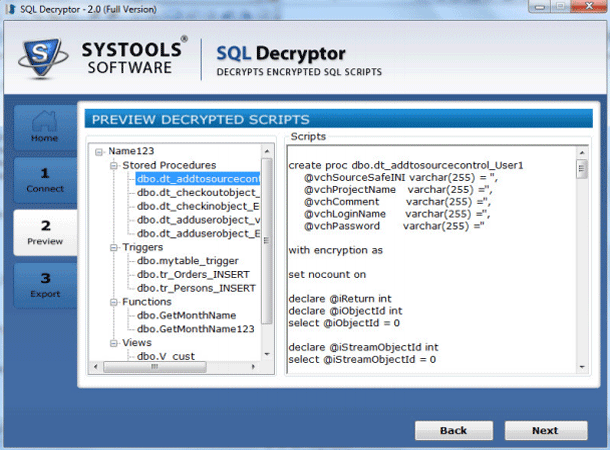 Demo version of the SQL Decryptor show you complete preview of Decrypted Scripts like Views, Triggers, Functions, Stored Procedure.